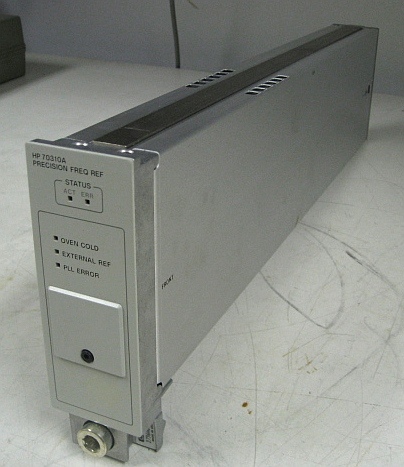 The Agilent 70310A precision frequency reference, a 1-slot wide plug-in module for the Agilent 70001A mainframe, provides precision reference signals for use by Agilent 70000 systems and other instruments. System frequency accuracy is enhanced because the 10 MHz and 100 MHz reference signals provided by the Agilent 70310A are phase-locked to an internal ovenized oscillator, resulting in excellent stability over both time and temperature. With a highly accurate and stable reference in your system, you can find signals more quickly by tuning to very narrow spans. Option 002 deletes the ovenized oscillator and the accessory power pack from the Agilent 70310A, but retains the external reference input capability. This is a good low cost solution if you plan to connect a house standard or other external reference permanently to your Agilent 70000 modular spectrum analyzer.